The writings of Ibn Khaldūn, particularly the Muqaddimah (Prolegomenon) have rightly been regarded as being sociological in nature. For this reason, Ibn Khaldūn has been widely regarded as the founder of sociology, or at least a precursor of modern sociology. While he was given this recognition, however, few works went beyond proclaiming him as a founder or precursor to the systematic application of his theoretical perspective to specific historical and contemporary aspects of Muslim societies in North Africa and the Middle East. The continuing presence of Eurocentrism in the social sciences has not helped in this regard: it often stands in the way of the consideration of non-Western sources of theories and concepts. This book provides an overview of Ibn Khaldūn and his sociology, discusses reasons for his marginality, and suggests ways to bring Ibn Khaldūn into the mainstream through the systematic application of his theory. It moves beyond works that simply state that Ibn Khaldūn was a founder of sociology or provide descriptive accounts of his works. Instead it systematically applies Khaldūn’s theoretical perspective to specific historical aspects of Muslim societies in North Africa and the Middle East, successfully integrating concepts and frameworks from Khaldūnian sociology into modern social science theories. 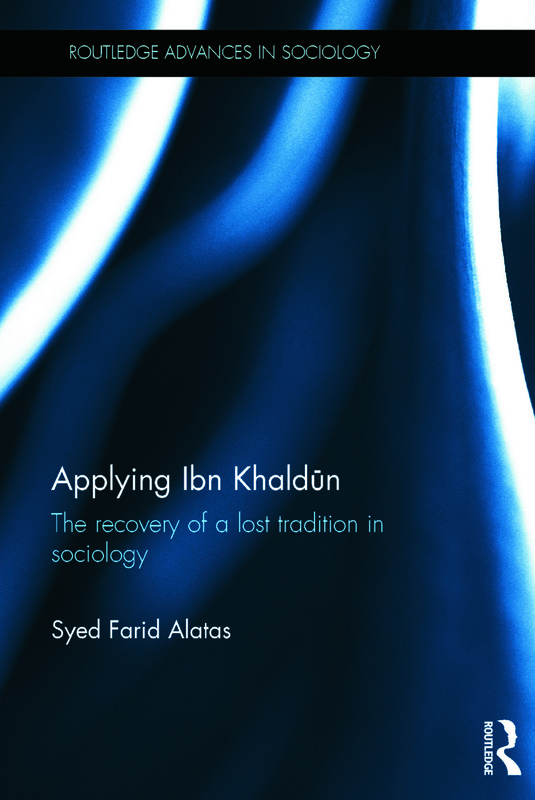 Applying Ibn Khaldūn will be of interest to students and scholars of sociology and social theory. Syed Farid Alatas is Head of the Department of Malay Studies and Associate Professor of Sociology at the National University of Singapore. His books include Democracy and Authoritarianism: The Rise of the Post-Colonial State in Indonesia and Malaysia (Macmillan, 1997), Alternative Discourse in Asian Social Science: Responses to Eurocentrism (Sage, 2006) and Ibn Khaldun (Oxford University Press, 2012).